In my last blog on 12 May I discussed some of the differences between the France 1946 10f Luxembourg stamp, issued on 29 July, and the 1948 12f and 15f reissues issued on 10 May and 10 December respectively. In that blog I suggested the possibility that the reissued values may have been different engravings. Now, I have to say, I did struggle with this idea. Why go to the trouble of re-engraving an entire stamp? 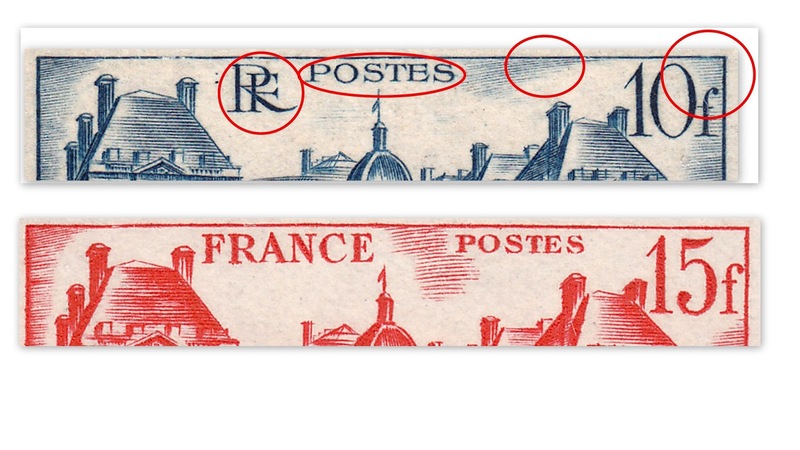 And also, a fact that was pointed out in a very good blog by a former French printer (click HERE for the blog), no engraver, no matter how skilled, could replicate the exact same lines in a stamp. Such an endeavour would take even longer than the normally time-consuming and laborious job of engraving a unique design. Why go to all the fuss? Why indeed! Well, it turns out France's postal authority didn't go to all that fuss. Either the original master die engraved by Albert Decaris or the transfer roller (not sure which) was altered in order to update the values. So why then did I even entertain the notion of a re-engraved stamp? Well, firstly, as I pointed out in my last blog, it wasn't only the values that were changed. RF was changed to France. The position of Postes is different. And the shading lines along the top have been, naturally, altered to accommodate the changes. Another bit of information regarding the above changes that I have found out since my last blog is the probability that Albert Decaris did not engrave the changes. These were, in all likelihood, executed in-house. The changes to the upper area of the reissues was not the only reason I considered the possibility that they were re-engraved. When I studied the 10f stamp against the 12f and 15f stamps I discovered many small differences that caused me to consider the possibility of an all new engraving. But the answer as to why there were so many small differences is quite probably twofold. And the first cause actually contributes to the second cause. In order to explain the first cause for the subtle changes we need to understand the basic process of transferring an engraving to the printing plate. Basically what happens is the engraver creates an image in reverse on a metal die, which is the same size as the stamp. That die is then hardened. Then a transfer roller is applied to the die and rocked back and forth, impressing the image, now the right way around, onto its surface. The transfer roller is also hardened. Now that the image is fixed into the transfer roller it can be transferred to the printing plate. 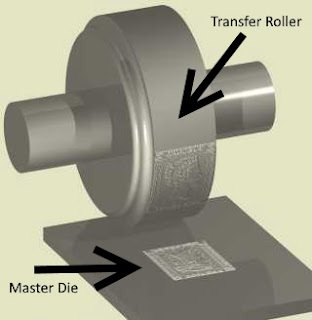 This is done in a similar way to the master die/transfer roller exchange. 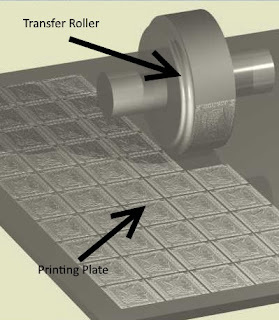 The transfer roller is applied to the printing plate over and over, depending on how many stamps are required per sheet. In the case of the Luxembourg Issue there were fifty stamps per sheet. So the transfer roller was applied to the plate fifty times. Okay, now that we've discussed the process of plate production we can examine where the changes to the actual stamps start to occur. As I said earlier, in order for the printing plate to be created the transfer roller needed to be literally pushed into the metal of the plate some fifty times, and that is just for the first plate of the first issue (I have no idea how many plates were made for this issue). So we can naturally assume that the transfer roller developed a certain amount of wear and tear over time. This wear and tear would appear on stamps as blurry, less crisp lines within the image. This is exactly what we see in the re-issues. The second cause of the changes was the colour choice for the re-issues. Two shades of red were used for the re-issues. According to Y&T the 12f was red-carmine and the 15f was plain old red. Red is notorious for having the effect of blurring images. Then when we add the fact that the lines on the plating plate were themselves starting to blur...well, we have our answer! To conclude my rambling, the Luxembourg Issues were not re-engraved. The subtle changes in the stamps are due to wear and tear on the printing plates and the colour choice of the stamps. It is not just a single but several "relief transfers" on one and the same transfer roll that have to be made from the master die to be used for the production of the original stamp. Moreover, to produce its derivative(s), e.g. value tablet changes, the master die has to be used again to generate another "relief transfer" (or more of them for further values) on which to erase the undesirable parts of the engraving and, after hardening, to be used for the creation of the secondary(/tertiary) master die(s). It is here where its derivatives are created that the master die suffers from wear and tear, not while the tranfer roll is pressed into the printing plate some fifty times. My problem is that my mother tongue is Czech and I have never seen this process dealt with in English, only in Czech and French, and therefore I lack the proper terminology in English. That's fantastic!! I now understand the process clearly. Appreciate the help. My eyesight is far from perfect at my age of 79. Cannot see your miniature photos properly. Besides, how do I know whether your minute indistinct photo shows a river / lake / seaside ??? I am a foreigner even though I had been teaching English in my country in Central Europe for the whole of my career. So how do I know what street numbers in Australia look like? In my country only houses are numbered. Ce deuxième poinçon à 12 f a servi pour un troisième en enlevant le 12, pour une nouvelle valeur à 15 f. Ces changements ont sans doute était faits, non pas par Decaris, mais par un des graveurs de l'atelier, la forme des lettres a changé. The "secondary master die" with the 12 f value was used for producing a "tertiary one" by removing the figure 12 to be replaced with a new value 15 f.
These changes will not have been made by Decaris but by one of the engravers in-house, the shape of the letters being changed. A chaque fois qu'on prend une empreinte par pression sur la presse à transfert, il y a une perte dans la gravure. Des traits sont plus faibles ou disparaissent. Les tailles de la gravure s'arrondissent. Un graveur doit intervenir pour regraver, renforcer certaines tailles plus profondément comme pour les traits entre France et Postes en haut du timbre. Each time an imprint is taken under pressure on the transfer press, there is certain loss in the engraving. Some lines are weaker or disappear. The incisions of the engraving are rounded. 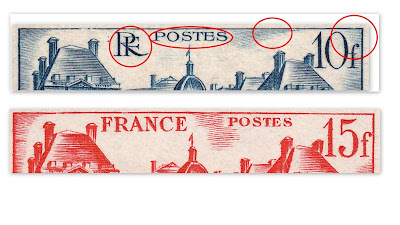 An engraver has to intervene to re-engrave, deepen certain cuts such as those between the inscriptions "France" and "Postes" at the top of the stamp. Mais pour ce timbre à 15 f. l'encrage semble engraisser les traits du Palais, c'est très probablement cette encre rouge, qui à l'époque était plus difficile à essuyer sur les clichés par la matière du cylindre essuyeur, surtout dans ce sens de l'impression, ce qui donne ce résultat un peu lourd et bouché. the time, was more difficult to wipe from the printing cylinder by the material of the wiping cylinder, especially for that particular sense of printing, resulting in somewhat heavy and dense lines. L'usure ne se fait pas sur le cliché d'impression, mais il se produit un mauvais transfert à chaque fois, même léger, c'est inévitable, et à force cela se voit sur le résultat final, surtout après un troisième transfert ou plutôt une troisième molette. which duly becomes manifest on the final result, especially after a tertiary transfer or rather a tertiary transfer roll has been used. Maintenant avec la gravure numérique, il n'y a plus ce défaut, c'est l'ordinateur qui fait les modifications. Il n'y a plus de transfert. Now with digital engraving, there is no such failure because it is the computer that makes the changes. The transfer roll process is no longer used.